Jim Mclatchie (Number 7 in the Ayr Seaforth vest) trailing Mike Beresford with Bert McKay behind wearing number 2. Jim McLatchie is not a name that many in Scotland in the twenty first century are familiar with and yet he has many claims to fame that are all worthy of respect: a first class track career, in the main as a miler, one of the first Scots ever to go on an athletics scholarship to the United States, and coach to a whole host of Olympic, World Championship and other athletes as well as many record breakers. Respected as a coach the world over but almost unknown in Scotland! Always ‘Big Jim’ because he was literally head and shoulders above anyone else on the start line, he competed in the late 50’s and 60’s against such as Hugh Barrow, Kenny Ballantyne, Bert McKay, Ian McCafferty. We can begin by hearing from Jim himself and looking at his answers to the questionnaire. How did you get involved in the sport? Played soccer in schools (International Trials). In athletics, started off in the High Jump but there were no facilities. Everywhere I went I seemed to be running. My grandparents lived three miles from my village, so I would just go off and visit. I started out racing 880y and then the Mile. I enjoyed cross-country and managed to win most of the races I ran in as a Junior including the Scottish Championships. Has any individual or group had a marked effect on either your attitude to the sport or individual performances? Ted Hayden, University of Chicago) showed me how to be involved as a competitor, coach and Meet Director. I took these attitudes and started a club when I moved to Houston, Texas. I managed to develop several athletes who competed in the Olympics and World Championships; directed the USA Cross-Country Championships twice; women’s cross-country trials and the Masters Track & Field Championships. What exactly did you get out of the sport? The sport got me out of the coal mines – gave me an opportunity to travel and see the world. Can you describe your general attitude to the sport? I enjoyed the old days – everyone worked for a living – squeezed their training in whenever possible – never avoided one another. Today most of the runners are more interested in what monetary rewards are available. As coach of several USA teams, a few athletes refused to represent their country because they wanted more than $10 per diem and a uniform. What do you consider to be your best ever performance? In 1963 in Houston, Texas. I won the Mile in the “Meet of Champions” beating Jim Ryun who was getting ready to puke as we neared the finish line. Kept thinking, “Cannot have that bugger puking on me” which seemed to spur me on. The winning time was 4:07 in 90 degree Heat. What ambitions did you have that remain unfulfilled? It’s hard to believe that coming from a family of eight (5 boys, three girls) and growing up in a one room house with no electricity or running water that I managed to achieve what I did. Everyone’s dream of course is the Olympics – I didn’t make it, but the consolation was great. I travelled the world, met some interesting people, and an education that money can’t buy. What did you do apart from running to relax? I like to watch horse racing. I write some computer programmes to help me pick a winner – hardly ever happens as I am not in the know! I can bet on-line and watch races from all over – even Ayr. What did running bring you that you would have wanted not to miss? All the characters that the sport produces. I officiate Track & Field meets – and have been the head judge for the shot, discus and hammer. When you are running round a track, sometimes you forget that there are other athletes competing in what might seem an alien event. Can you give some details of your training? At present – nothing. In the old days running on grass as much as possible. Used to do a lot of my lunchtime running on Haggs Castle Golf Course in Pollokshields (I worked for the railway). I believe that when I was younger I did too much speed workouts with not enough rest between the hard sessions. Like most of that generation, training was a ‘hit or miss’ situation. Conditions in Scotland were rough – snow, sleet, rain and heavy winds. Texas – hot, humid and windy. Not the ideal set-ups to run fast. Although known mainly as a track man, he competed well on all surfaces and he said above that he enjoyed cross-country running. The best domestic results that I have are when, as an Under 20 runner in 1961 he won both the Senior and Junior titles over the heavy mud of the South Western District Cross Country Championships in the same race. The next year he won the Scottish Junior Cross Country Championships at Hamilton Race Course from Mike Ryan and Jim Alder. In the 1966 Commonwealth Games Alder would win the marathon and Ryan would be third. Ryan also finished third in the notorious Mexico City Olympics in 1968. I asked Jim why he didn’t run in the International Cross Country Championship that year and he said that he was told he could not run on the senior team and he wasn’t sure of a Junior team was sent. He received an invitation to run in Belgium but the SCCU would not let him go; they said he was too young. He did race in Germany but on return to Glasgow he was asked to give back the track suit with which he had been issued, failure to do so would mean that he was never picked for Scotland again. Rather Draconian but read Lynne MacDougall on the same subject!. He adds, rather unnecessarily, that the Union was awful back then. The standard of road and cross country running was high back then and Jim had lots of good races – eg in the 1963 Nigel Barge Road Race he was second behind Fergus Murray and ahead of Lachie Stewart. They say big men are not suited to road or cross country but Jim was always a respected contender having beaten all the top men, Lachie Stewart, Fergus Murray, Jim Alder and so on at one time or another. He deserved a cross-country selection for the international but it never came and his many dark blue vests were all won on the track. 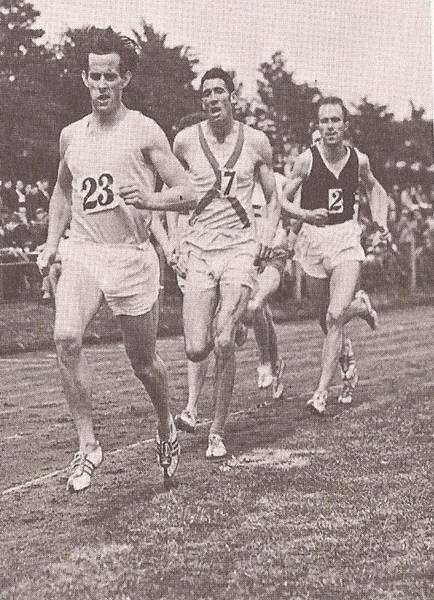 He was a noted competitor on the track too, more than held his own against the top men in the country and picked up several Scottish international vests, but a Scottish title always eluded him although he had second places in behind Ken Ballantyne (1959) and Mike Ryan (in 1960) – both as a Junior – Graeme Grant and Ian McCafferty. Jim moved to stay with his aunt in Milngavie, Glasgow, 1962 and just 200 yards along the road from him lived Brian Scobie. They became good friends, training and racing together and eventually they both became top flight coaches. In the 1980’s Brian had among his charges the best squad of women distance runners in Britain as well as some male international athletes of high repute. Brian says he already knew of Jim, having read about him in the newspapers. They used to train together at the Maryhill Harriers training track with coach Tom Williamson who also coached some of the country’s top women runners. Jim’s best times from his first appearance in the Scottish ranking lists were as follows. The figure in brackets is the Scottish ranking for the year. In 1959 he ran for Doon and in ’60 and ’61 it was Muirkirk Welfare before he moved to Ayr Seaforth AAC in 1962. Jim (4) in the match v Ireland and Holland in 1962. Chicago, Nov 28. The carrot-topped Irishman did it again. Making only his fourth start of the cross country season, Loyola University’s Tom O’Hara kicked home to win the second annual United States Track and Field Federation’s Cross Country Championship at Washington Park. Under bright skies and in moderate temperature, O’Hara clocked 30:12 .1 for 10000m on a rather slow course. Left in O’Hara’s wake were the Scotsman Jim McLatchie, Polish born John Macy, Costa Rican Juan Marin and Australians Geoff Walker and Laurie Elliott. Macy was on top at three miles in 14:45 but McLatchie took the lead at four in 20:01. Jeff Fishback had moved up with the leaders in the fourth mile and six runners were within a four second spread of 20:01 – 20:05. Macy began to fade a bit in the fifth mile as did Marin, leaving Brown, McLatchie, O’Hara and Fishback in the front-running group. Macy however wasn’t finished. Reminiscent of his National AAU six mile against Pete McArdle this year in St Louis, the Houston runner moved back up to within fifteen yards of the leaders with a half mile to go. That was O’Hara’s signal. He stepped on the accelerator and added another national championship to the NCAA title won in 1962. Tom O’Hara 30:12; 2. Jim McLatchie 30:17; 3. Jeff Fishback 30:22; 4. Doug Brown 30:20; 5. John Macy 30:22; 6. Julio Marin 30:36; 7. Geoff Walker 30:57; 8. Laurie Elliott 31:04. Jim comments on that race – O’Hara was a tough nut to crack: I was leading him with 5 yards to go in a 1500m race the following month in New rleans but he snuck by before the tape! He made the Olympic team that year and broke the World Indoor Mile. Record The photographs below are from the race. That was the year in which Jim was injured and despite the fact being obvious he was not allowed to rest the injury because the College required him to run. He came home and ran in the SAAA 880 yards where he finished second to Graeme Grant and they were both chosen to represent Scotland in that event. Jim’s best times over the years 1963 1965 were as follows. All were recorded as ‘Ayr Seaforth’ or ‘Lamar State’ and races were run on both sides of the Atlantic. 1500m, Scotland v Iceland 1966. At Luton he had coached, among others, the talented Tony Simmons before returning to the States. 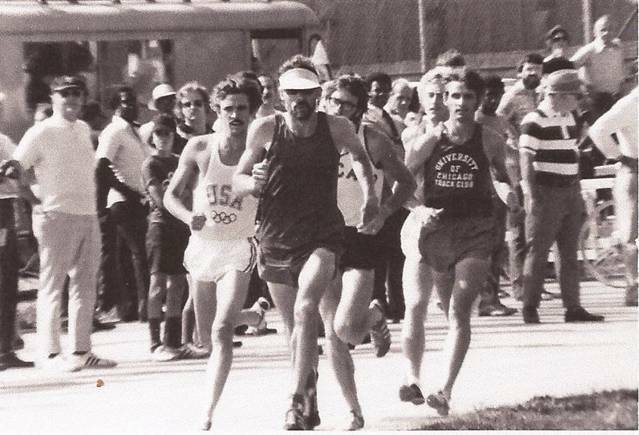 Jim landed in Chicago where he competed for the Chicago Track Club and ran in several Distance Medley teams with Rick Wolhuter. He spent seven years in Chicago, racing on the same team as Wolhuter and travelling to meets with Brian Oldfield, a renowned shot putter. The indoor track in Chicago was a 220 yard dirt track and he ran a steeplechase indoors in ‘about 9:10’ – that doesn’t tell all of the story however as the water-jump was into the long jump pit! He also ran a 4:10 mile on that track. He was starter in several meets and sprinter Wilma Rudolph called him Wyatt Earp – ‘the fastest gun in Chicago!’ He reckoned that the indoor 60 yards race took forever with the ‘no false start’ rule, so he he speeded it up by not holding them too long in the start position. As a competitor he won several Mile and 1500m races and also raced in some cross-country raceswhere the team finished second a few times to Florida TC (Shorter, Bacheler, Galloway etc). He moved to Houston in 1975 and with Allan Lawrence (who had been third in the 1956 Olympic 10000m) and Len Hilton (who ran in the 5000m at the 1972 Olympics), started a running club called the Houston Harriers which was modelled on the British club system and was very successful. Outside running he had been working in the computer field. Houston was to be where Jim McLatchie’s athletic career as official, administrator, organiser but mainly coach, took off in the most spectacular fashion. Any doubt about his status in the community is removed by the following report when he retired in 2002. They call him tough, rough and crusty – a running coach with a philosophy of ‘my way or the highway’ But when Jim McLatchie shows up at the track with his famous red-covered clipboard containing the day’s workout, runners know they’re getting the best. 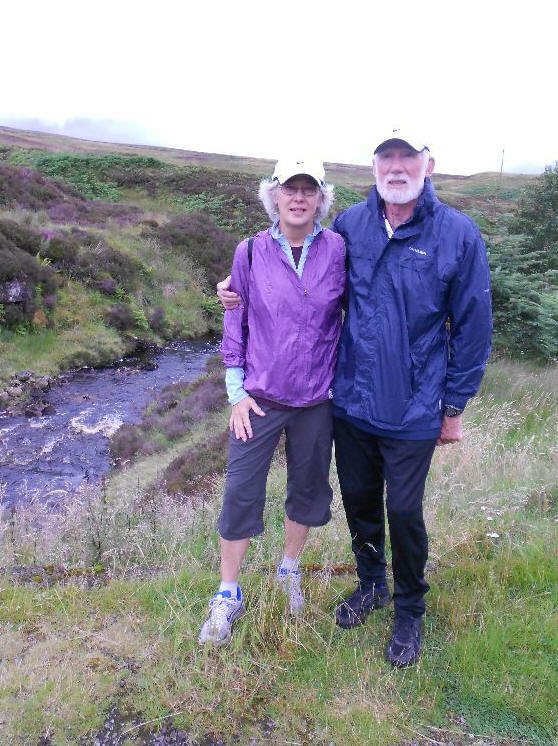 Now Jim and his wife, champion runner Carol McLatchie – Houston’s first couple of running – are heading into retirement and moving to Bend, in central Oregon. McLatchie will leave behind nearly 30 years of coaching success stories and the well-known club he helped to start in 1975, the Houston Harriers. He has coached some of Houston’s most talented runners for years, runners who continue to dominate the winner’s lists at area races, such as Sean Wade, Jon Warren, Justin Chaston, Joe Flores and Joy Smith to name just a few. His coaching offered a support system – runners helped each other reach their goals, and the workouts were not based in the star system. ‘The key to success is, can you build upon each previous workout,’, said McLatchie. That philosophy helped spur a host of champion runners and a series of titles through the years. Carol McLatchie is on sabbatical from running right now, but she continues to hold titles – like the American Female Masters 30K, and was named by Runner’s World as Masters Runner of the year in 1993. She is in her sixth year as Chair of the USA Track & Field Women’s Long Distance Running Committee. She met Jim at a track meet and starting training with him in 1979. They have seen young runners blossom, succeed and become champion Masters. But their ranks are slow to fill. ‘There’s no really good young ones coming up,’ says Jim McLatchie. In March, Jim will retire from his long time job overseeing systems and programming operations in Information Systems Administration for the City of Houston, the job that paid his bills all these years but an occupation few people knew about. The coaching he did was never a money maker – it was what he gave back to the sport. From his early days in Scotland, working in the coal mines at 15, running offered him the freedom nothing else could. McLatchie will keep in touch with many of his runners, Email makes it easy to communicate, and ‘the telephone still works,’ he said. What had inspired this eulogy? Quite simply he had had success on a large scale and he had a personality that they Texans took to their heart. He was by now a coach first and foremost – just look at the following tables to illustrate this. First table is the list of Olympians he has coached. and these are only the major championships – there are even more in World Masters, PanAm Games, State Champions, etc. Little wonder that he was interviewed for the post of Scottish coach, a wonder that he was by-passed! He was a genuine hero for his coaching in Houston. He hadn’t forgotten his old Scottish friends however. In the mid 80’s Brian Scobie had a wonderful squad of endurance runners and he took some of them to Houston for the marathon there. Runners like Angie Hulley/Pain ran well but Veronique Marot was third in 1984 (2:31:16) and won it three times (1986 in 2:31:35, 1989 in 2:30:16 and 1991 in 2:30:55) and Brian won the Masters race in 1987 with a time of 2:30:59. Jim’s own runner Martin Froelich won it in 1985 in 2:11:14. These coaching feats had to be recognised and Jim had brought himself to the forefront of USA endurance running coaches and his reward was international coaching assignments which are shown in the table below. The fifth of these was unexpected but he explains that he went to England two to three times a year to work with Mark Rowland and the UK steeplechasers – and remember that Justin Chaston who was being coached by Jim competed in three Olympics and one World Championships for Britain. Jim clearly had something to offer on that front. Mark is now in Eugene, Oregon where he is the coach for Oregon Track Club. What about the club that he set up with Al Lawrence away back in 1975? Houston Harriers? Well. he was a coach at the club from 1975 until 2001. The club has approximately 100 members and the focus is on middle distance, distance and marathon running for High School, College, Open and Masters athletes. The club was/is very successful and members have won more than seventy five USA National titles in twenty five years in events on the track, on the road and over the country. Quite a record. All coaches will now be asking what he did with the runners. Information in the public prints is hard to come by but there is an interview with Donna Stevens easily available on the internet and in reply to the question ‘Can you give an insight into training in Houston in the 80’s?’ she gave this answer. “ In 1979 I started training with Jim McLatchie and the Houston Harriers. In a few years we had a group of 25 – 30 totally dedicated distance running athletes who met at Houston Baptist University on Mondays and Wednesday nights for track workouts and Saturday mornings for long runs. On the track we were separated into groups of four to five runners that could run close to the same times. Jim would have our workouts in his “black book” that he brought to the track. Lots of Mondays, we would run 6 x 1 Mile or 12 x 800 with a 200 jog between. On Wednesdays we might have a mile breakdown of Mile, 1200, 800, 400 with 400 jog between. We always ran hard on the track, holding nothing back, my heart rate was over 200 bpm. Our long runs were 18 – 30 miles. During marathon training, I did 2-a-days by running 4 miles in the morning and 6 – 12 miles during the evening (including our track days) with a 20 plus mile run on Saturdays and an 18 on Sunday. I always built up from 70 miles a week in the off season to 100 – 120 peaking before a marathon. He is now at Bend in Oregon where he is coaching at the local high school – the Summit High School referred to above – and enjoying retirement. The boy from the coal mines in Ayrshire has come along way in every sense and it is all down to his own attitude and hard work. And to me, one of the most amazing things is that he has done it all while holding down a serious day-job. It was never paid employment. I had thought that I had finished the profile there but Jim had other ideas. We left him coaching at Summit High School after retirement – then in March 2012 we had an email saying that three of his girls had been 1, 2, 3 in the State Championships in the 1500m. The first time it had been done! He had coached the mother and grandfather of the girl who won. Michelle Dekkers won the NCAA Cross-Country but was originally from South Africa. She had moved up to Bend just so that her daughter Ashley could be coached by Jim. Ashley who won also won the 800m and is headed for a scholarship at University of Oregon in the autumn. The link is at http://www.runnerspace.com/eprofile.php?event_id=118&do=videos&video_id=46503 . The Girls won their league of 12 teams with a total of 106 points with second placer on 74 points, and the Boys won their with 88 points ahead of the second team’s 67.5; there were also 12 teams in the league. And as of August 2013, they have continued to do him proud winning State and League titles with amazing regularity.